A large country in the heart of Europe the culture here is to gift flowers when visiting a Polish home. Remember to include Chocolates, sweets or wine with flowers. 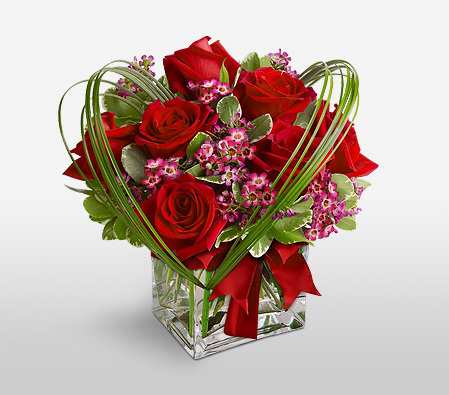 Sending flowers on occasions are birthdays, Anniversaries and Christmas is never missed. It’s important not give yellow chrysanthemums as they are only used for funerals. Make sure to send odd numbers and should be unwrapped before being given to the recipient. 11th November is the national Independence Day & 3rd May is constitution day & flowers are in great demand. Send flowers same day to Poland using our local florists & flower shops. Order by 12 noon. Send Easter Flower Arrangement, Easter Hampers & Gift Baskets to Poland. Send Roses, Carnations, Lilies throughout Poland for occasions like Birthdays, Anniversaries, Funerals, etc. Enjoy affordable flower delivery across Warsaw, Katowice, Wroclaw, Gdansk & nationwide delivery. A chic arrangement, of vivid red roses and sprays of wax flowers nestled against a cluster of variegated pittosporum. They are placed in a clear glass cube trimmed with a red satin bow, encircled by an evergreen, heart shaped halo. How do i send International Flower Delivery to Poland? Flora2000 has transformed International flower delivery to Poland into a fine and effortless art. With our efficient flowers & gifs delivery services worldwide; you are sure to find the perfect expression of your message to your loved ones. Be it Roses, Lilies, Carnations or Cakes, our gifts are sure to make both the sender and the receiver happy. We make sure the gifts you give reflects what you feel about the receiver. Most common flowers used for All Saints Day and decorating graves are yellow and white chrysanthemums. Yellow flowers appear to be just like divine. it is an irony that yellow chrysanthemums are also used during All Saints celebration along with funerals. That’s the reason it has been an inadequate choice for birthdays or weddings. 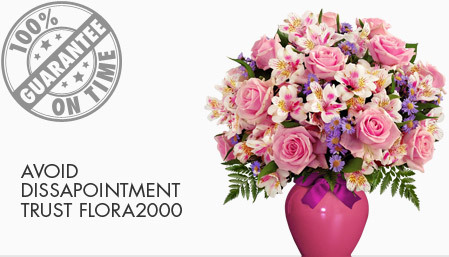 We at Flora2000 bring together elegant designs, guaranteed on time flower delivery to Poland with personal care, and the finest quality to offer you luxurious floral arrangements for those special occasions like Birthday, Anniversary, Sympathy, Funerals, All Saint day, Teachers Day (14th October), Valentines day etc. Women’s day was replaced by Valentines Day in Poland. Send flowers and make special occasions even more memorable for your loved ones by delighting them with enchanting ensembles. Rely on us to send flowers online across the Poland and it's cities by choosing something stunning from our lavish collection of bouquets and exquisite gifts. In Poland, there is no such term called as Christmas flowers. Polish people prefer to use coniferous trees designed with pines and other decorative materials like candles, Christmas balls etc. during Christmas. Poles like to design their houses using decent and simple flowers like jonquil, daisies, marguerites, hyacinths and few more. All Saints Day is one of the biggest occasions which is celebrated at the beginning of the November. Fall flowers like chrysanthemum are their most favourite choice for All Saint day and funerals. Wreaths are also used during funerals and Slavic harvest feast called Dozynki which is celebrated in the countryside during Fall after harvest. Poles generally place wreaths at the entrance of their houses whereas in American countries, wreaths are used during thanksgiving. We have an exclusive collection of flower arrangements, hampers & baskets for this Easter. Our classy collection of flowers & Gifts for Easter to Poland.